Stamps used are “Scootin’ Bear. Lg.”, “Tree Trunk”, “Scenic – Large Brownie Rock”, “Scenic – Two Trees with Birds”, “Scenic – Tall Brownie Grove”, “Rocks & Grass”, “Tall Grass, Lg.” and “Scenic – Long Branch.” Images are stamped with black Memories ink and colored with pencil. Card by Lynn Lane. 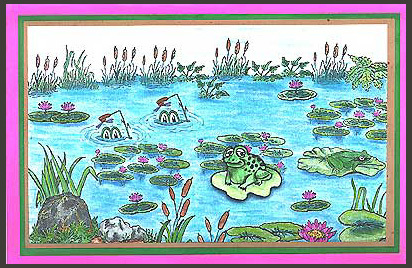 Stamps used are, “Margaret’s Frog on Lily Pad”, “Frog on Lily Pad, Sm.”, “Dinner in Sight, Sm.”, “Cattails”, “Swamp Grass”, “Tall Grass, Lg.”, “Leafy Plant”, “Rocks & Grass”, “Large Brownie Rock”, “Lily Pad Flower”, “Lily Pad #1”, “Four Brownie Cattails”, “Lily Pond”, ” Ivy”, “Lily Pad.” White card stock was stamped with black Memories ink and colored with pencils. “Margaret’s Frog on Lily Pad” was cut out and mounted with foam dots. Card by Margaret Wiggin. Tags: cattails, Colored pencils, Dinner in Sight Sm., Foam tape, Frog on Lily Pad Sm., Leafy Plant, Lily Pad, Lily Pad #1, Lily Pad Flower, Lily Pond, Margaret Wiggin, Margaret's Frog on Lily Pad, Rocks & Grass, Scenic - Four Brownie Cattails, Scenic - Ivy, Scenic - Large Brownie Rock, Swamp Grass, Tall Grass Lg.